In my past life as one of those working persons when the temperature got really low as it is forecast tonight and tomorrow night, into the minus teens in rural areas according to the BBC I kept a fire going on Waterlily. In 2011 I was actually driving to the boat at lunchtimes to keep a fire in. It would have been 2011 as we had a frost burst in 2010 - the last really cold winter. Now with some planning - well a lot of planning I have driven up from Chichester to be aboard for a few nights. It also gives me the chance to see my 29 year old son before he becomes 30 !! Also help a friend to move house and to catch up with my old boss to compare notes on retirement - plus make some golf and fishing plans !! Then it'll be a late night Friday run to south London for more bathroom duty (plastering and tiling this weekend ) with Rachel coming the other way. We knew these few weeks were going be a challenge and so it is. A large batch of stew made last night with a bread and butter pudding has set us both up. Lets see what the weather brings and let's hope it is the last of the cold stuff.... I have hobbies that do not fit with snow and cold !! Just put the external temp probe above the boat at 6pm its 22.5 c in the boat (nice) and -1.5 c outside. Well done Squirrel ! We survived, as did Percy, down to -6.5c last night. Ice on the windows and the canal well frozen. Tonight is going to be colder apparently! We have had four boats if you count the share boat. Two with pump outs and two with cassettes. Our current boat has a cassette and that was part of the buying criteria. Pump out are expensive, can be smelly and limiting in time and cruising, IMHO of course. However today was one of the few times I'd have preferred a pump out. Two of my three cassettes were out of action - for the same thing, both had the 'holding' tray off its runner by too heavy handed use of the loo brush. There is only one fix and that involves getting your hands inside and stripping the mechanism to get it all lined up again. I do carry rubber disposable gloves for working on the engine so they were very much used. Rest assured both cassettes had a very good clean out before the open loo surgery took place. The problem is my third cassette does not have the level indicator on it so it really is the emergency cassette. I did the fix and stowed them away hopefully for another few years trouble (and cash free) use. I can’t remember how long I have had the 2kw genny. I think we must have had it when we had Waterlily, it must be a good 5 years old. It does not get much use, we have used it for powering the flymo plus the chain saw and most often the Dyson for a decent clean of the boat. Last time I needed it it refused to start, so yesterday I had opportunity after watering up to give it a look at. It needed an oil change for sure, like most generators they are emptied by tipping the device over while the oil plug is out. A fiddly and messy process. I wanted to have a decent look at it so took the side off. Lucky I did as I spotted the choke cable was out of its housing meaning it was running rich and no doubt part of the problems of poor starting and running. I also drained and cleaned the float bowl, not too dirty. Once fixed and fresh oil added, reverse sequence of filling, tipping the other way and filling until it was jut on the lip of the filler when on the level.... not a great idea but the only way. It started after a few pulls which would be the system priming, then ran very sweetly with the econ mode working well again. I have not put the double skin chimney on as the base of the outer skin does not allow the inner skin to fit into the flue, resulting in a little seepage of tar onto the roof I stopped with damp rags but far from perfect. So I fitted just a liner and have been running the fire with just that sticking 16 inches out of the collar, it's a tight fit and had proven reliable in keeping tar off the roof. I went to Midland Chandlers today to get single skin chimney but they had non on the shelves, having removed them as most were not big enough to drop well over the collar, the helpful lass got quite a few out to measure but did say many had been brought back as they did not fit . My collar needs six and a quarter inches so it looks like I will be visiting a few other chandlers with a tape measure. One thing having printing contacts I will not be paying nearly £20 for another liner, I’ll cadge a few plates from people I know and cut the plates to fit. Tomorrow I’ll be putting a few loops into some rope I got from MC so I can make up some smaller mooring ropes and use the existing ones as cruising ropes when I may need he extra length. Plenty more jobs to do, just need time ..... daft I know being retired and all !! Over the years while we have owned boats we have spent many or most of our wedding anniversaries on board. We rather foolishly got married on Valentine’s Day which while could be considered romantic also means getting a restaurant table and decent service on our wedding anniversaries is a problem. So we get some nice food and head to Percy. No different this year with me coming up from Chichester after a weekend in London at no2 sons flat DIY’ing and Rachel coming from Derby after being in London with me. Being first to the boat and with all the ‘stuff’ I set to bringing Percy out of hibernation. I last stayed on board in November when I based myself for the Motorcycle show in Birmingham. I have called in to check on a couple of occasions in between but this was a ‘water on’ moment. Having been caught out by frozen pipes on Waterlilty and a damaged water heater on Comet waiting for the pump to stop and the system to hold pressure is always a little tense. Percy had survived another winter so the fire got lit, the cat and dog brought aboard and the bed stripped and remade. The Dyson got used to give the boat a fresh feel. The donk took a couple of spins and fired on one cylinder for 30 seconds while the diesel got through to the farthest cylinder from the fuel supply. It was cold last night so the fire was kept well in and we slept the sleep of angels. We woke this morning to a frozen canal and a beautiful winters morning. It’ll rain later but we have nothing to do other than relax and recharge our batteries for the next few weeks that will be very busy. Not a good record for sure. I did do one many of you will not have done but I had to do it by cycle as it's disconnected and I don't think it ever was connected to the main system. It is the Chichester canal and I cycled it last week. It was really to test out my new electric bike, maybe more on that later but is was a nice if not short ride from Chichester to Chichester harbour. In my last post I rambled on about moving Percy to a marina. I have had such thoughts in the past and decided against and I may well do so if Fradley stays relatively untouched by developments around. But if not I have a shortlist of 5 marinas I may consider. However if you have any experience good or bad please let me know? If its bad then you may want to drop me an email ? 'The times they are a changing'..... I have moored my three boats at the same spot since January 2007. We owned Comet for just three months. She was a nice boat but I knew she was a maintenance challenge and having youngish kids at home and a full work life I did not have time to cruise and repair. 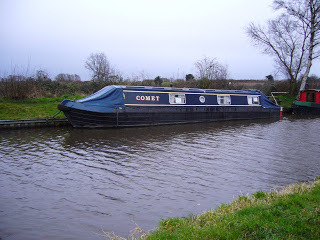 Plus at that time you could transfer moorings with boats and Hunts moorings did not come up too often so buying Comet got us the mooring we wanted. So Waterlily arrived Mid 2008 - I have checked for a decent picture of Waterlily at Hunts andf the first I could find was the following winter.... much of my Waterlily blogging was words and less pictures. And four happy years later Waterlily was gone -this is one of the last pictures taken just before we cruised to Great Haywood where she was sold. This is an old photo with all three boats in front of Waterlily being sold (The maroon boat, such as life) was repainted blue and sold and now lived on Kings Bromley Wharf. This photo is pre my other neighbour Mandy who brought Don't Panic there in I guess 2008 ? So why all the reminiscing? Much chat on the moorings about marinas housing estates and gravel extraction is coming to a sad reality. There is planning approval for a 60 boat marina just below Common lock, and I think a larger marina at Alrewas buit this may not get build. I like the boats and the marina being a little closed than the winding hole at Alrewas would be useful. The housing is extending out from Fradley and the field behind us is owned by one of the large builders - not that I expect it will get to Hunts in the next 10 or so years. The biggest sadness is there is approval for gravel extraction in the fields across the canal from us. So that will be noise, dust and a lot more traffic on the lanes. Basically the beautiful Fradley junction is being changed from what is was when we first had a boat. 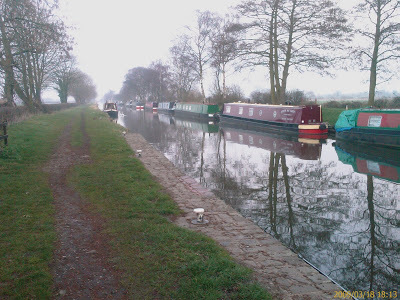 My mooring is up for renewal in July so I may have another year as I like it but as others may move on the community will dissipate and that is another reason not to stay. I am sad writing this but life moves on. I may consider a marina next time, less maintenance but a lot more cost. Plus we can stay a couple of years and move on so was can base ourselves around the system. I don't like change so it will take something to move me from Fradley but that something is on its way and the loss of fellow friends and boaters will be the real decider. Winters in the past have seen me living aboard Percy, hard but rewarding existence. This winter I think I have set a new record in time not on Percy. The last time I was aboard was in November when I used the boat as a base for the bike show in Birmingham. The irony is I am now retired and spending less time aboard ! There are good reasons for this, a family member is quite poorly and this is taking a lot of time and travelling to add in support around Rachel’s work and the distances we need to travel. I have been to the boat, essential checks really. My boat neighbours have been good in sending pictures - especially in the snow. I’ll not really know how Percy has survived until I light the fire and turn in the water in a week or so. It is our anniversary in February and we like to spend it aboard so that will be a good check all has survived.